I've spent nearly the last week with the most awful cold, keeping me indoors (boo!) – so I thought I'd take the chance to update something we did a little while ago. 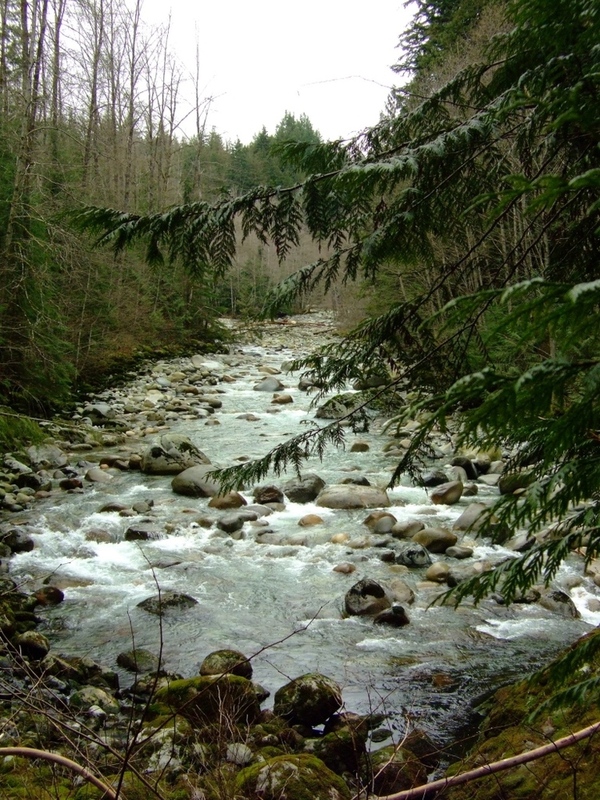 Lynn Valley is a temperate rainforest park covering over 600 acres, approximately one hour north of Vancouver city centre. The suspension bridge, which is free to visitors, has crossed the canyon since the early twentieth century, and the park has many trails to allow you to while away a few hours. Vancouver, as well as being renowned as 'the best place in the world to live', is known as an outdoorsy place; as a tourist, the locals are happy to point out the runners and cyclists downtown. Even in the city centre, the evidence of the outdoor life is everywhere: ski racks on cars, bike racks on cars, the four wheel drive cars… Notice the common theme? What's a visitor to do if they want to explore the landscape around this most active of Canadian cities – but they don't have a car? 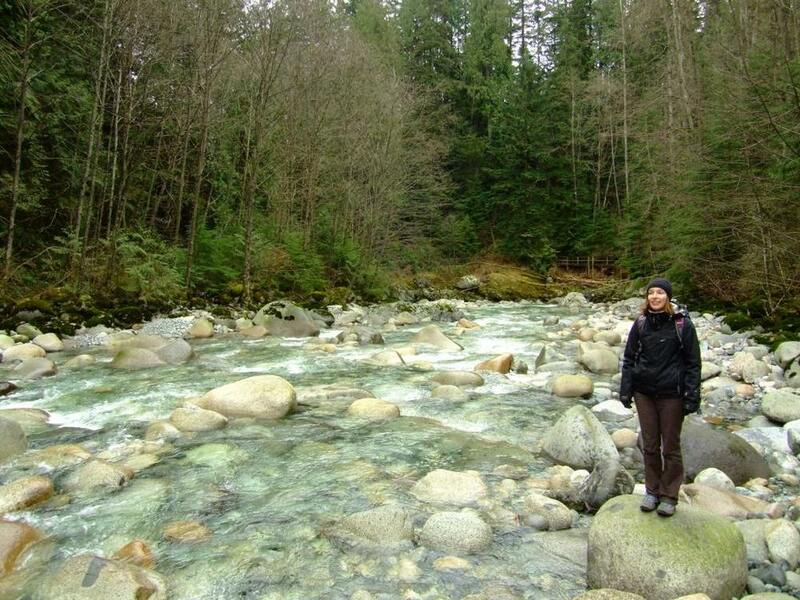 Lynn Valley provides the perfect answer. Leaving the peninsula of downtown Vancouver, you cross to North Vancouver by Seabus – today, the hills of Grouse Mountain and Cypress Mountain were swathed in cloud, hopefully leaving a dusting of snow on the bare green hills, shortly to host the Olympic ski jumping events. 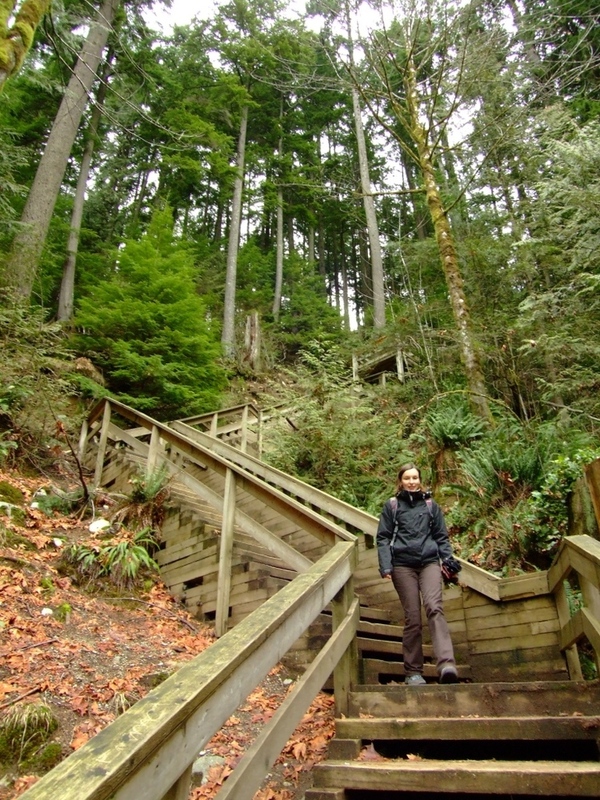 We joined the throng of other weekenders making the most of a dry day, and hopped onto a bus which took us up through the commuter belt of North Vancouver, right to the edge of the Lynn Valley park. The park itself is surrounded at its entrance by residential development, but it doesn't take long walking amongst the trees to feel that you're leaving settlement and civilisation behind. 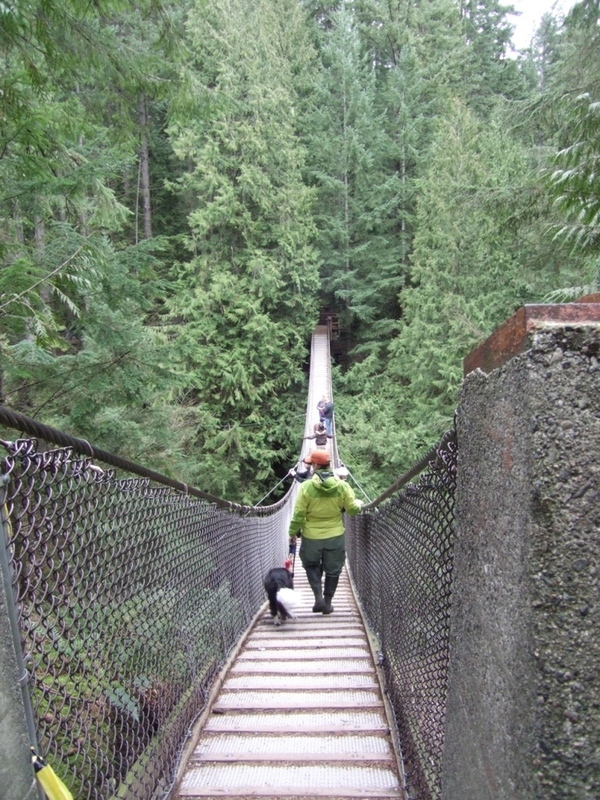 The suspension bridge, first opened in 1912, crosses Lynn Canyon at a height of 50 metres. The narrow bridge dips sharply in the middle, and provides a great view of the rushing water below, as it is forced from the leisurely pools upstream into the canyon. 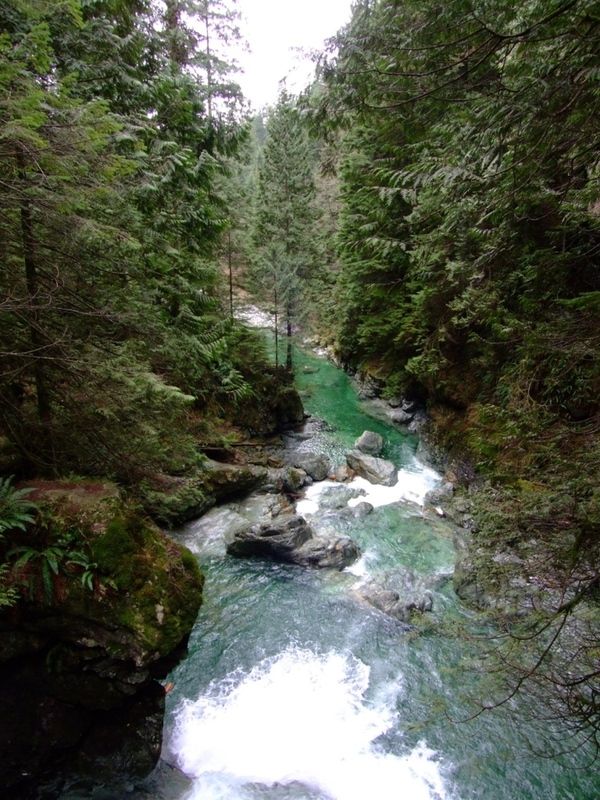 From the bridge, we headed downstream to another crossing of Lynn Creek, at Twin Falls, where the air cools and the moisture in the temperate rainforest shows as ferns and mosses amongst the trees. Having dipped down towards the Creek, we climbed up the steep wooden steps on the opposite bank, returning to the Suspension Bridge. 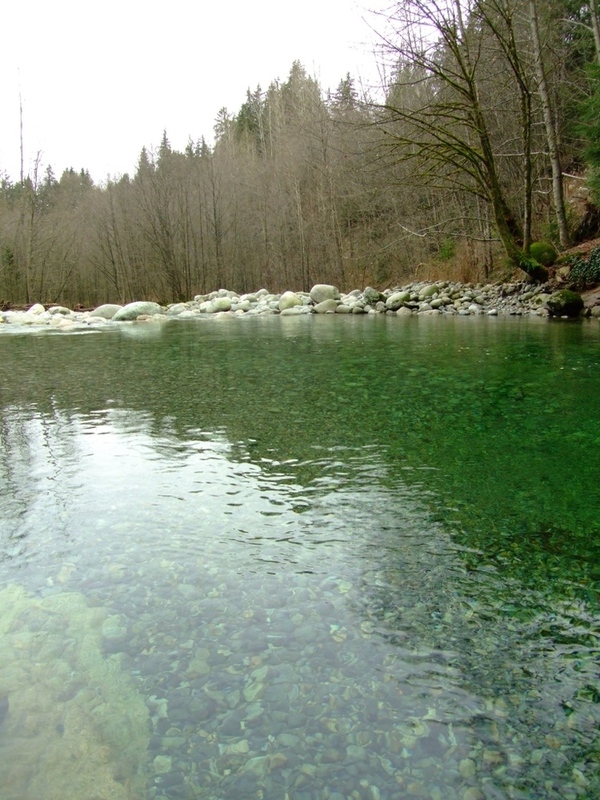 A second loop in our figure of eight walk took us alongside the Creek, upstream of the canyon, where we walked close to the shallows as the chill, clear water rushed over the pebbly shore. Following part of the Baden-Powell trail, a 48km trail on Vancouver's North Shore, we carried on up to the river crossing heading for Rice Lake; ramblers or cyclists with more time than us could carry on to Lower Seymour Conservation Area, but we turned back towards the Suspension bridge, taking time to enjoy the beautiful scenery around 30 foot pool, which was a tempting swimming spot, even in January. For us, with a few hours to spend and a reliance on public transport on a Sunday, it proved a perfect afternoon excursion and break from the city.